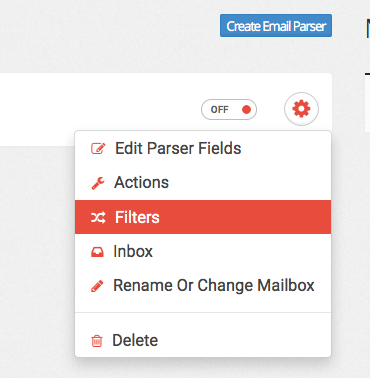 Parser Filter: This filter is used to allow or disallow specific emails from an inbox to be Parsed. This can be used to send different email formats from the same source down different paths. 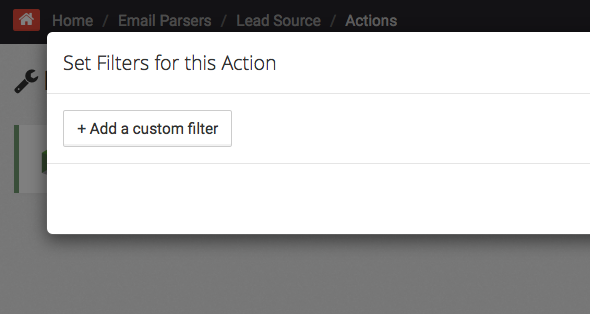 Action Filter: This filter is used to allow emails of the same format to travel to different sets of Events based on content of the email. This can be used to add contacts to Infusionsoft, while simultaneously sending them a text, or a voicemail. Event Filter: This filter is used to trigger or not trigger certain things within Infusionsoft, such as tags, orders, or notes. 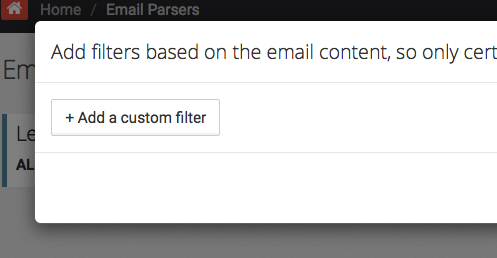 To add a filter to a Parser, click the gear icon, and select Filters. Then click Add a Custom Filter. 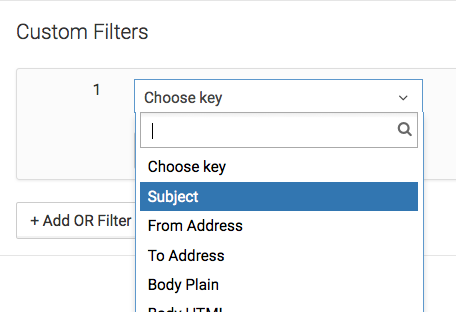 How you want to set your filter will be unique to the email you want Parsed. For example: The emails I receive from my lead source that contain new leads read: "New Lead from LeadSource.com" in the subject line. So in my filter I would want to select "Subject" from the first drop-down menu. Then I would select "(Text) Contains" from the second drop-down menu. And Lastly I would type "New Lead from LeadSource.com" into the text box and hit Save. This will insure that the only emails that get processed by this Parser have the subject line "New Lead from LeadSource.com". 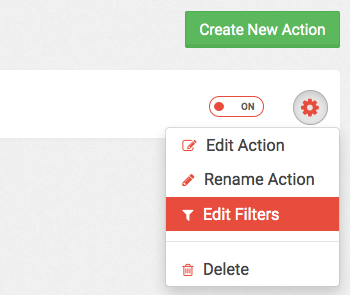 To add a filter to your Action, click the gear icon and select Edit Filters from the drop down. Then select add a custom filter. Now you'll determine the criteria you want to set for this filter. For example, I only want people who's phone numbers that start with "801" to travel down this path, because that will add it to my Infusionsoft business that is located in Utah. 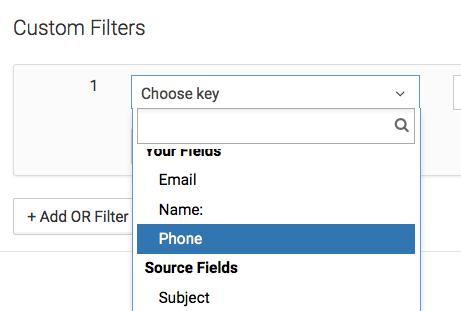 So for the first drop down, I'll select my "Phone" field. For my second drop-down, I'll select "(Text) Starts With". Lastly, I'll type "801" into the text field and click Save. 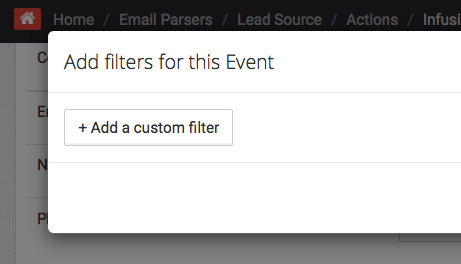 To add a filter to your Event, click the Edit Filter link on the Event. Then select Add a Custom Filter. Now determine your criteria for your filter. For example: I want to tag my customers based on what county they are located. I have a tag for each of my counties and an Apply a Tag event for each of those tags. For this tag I want it to apply if the emails "County" field has the value of "Weber in it. 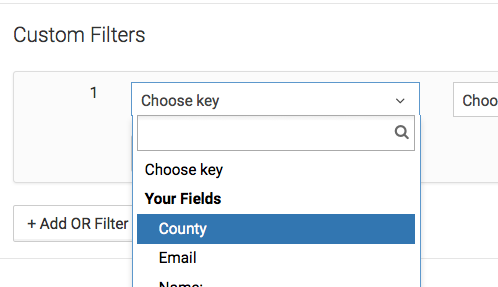 So for my first drop down I'll select my County field. For my second drop-down I'll select "(Text) Contains". And Lastly, I'll type "Weber" into the text field and click Save. Now this tag will only apply if their County field contains Weber.